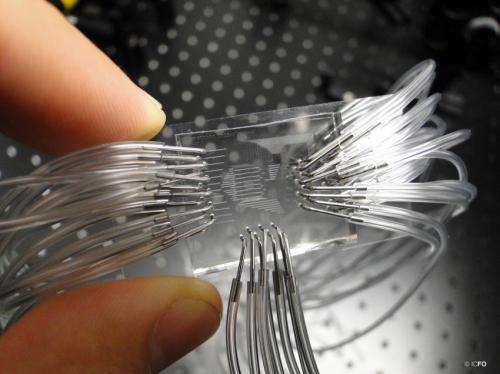 Although very compact (only a few square centimeters), the lab-on-a-chip hosts various sensing sites distributed across a network of fluidic micro-channels that enables it to conduct multiple analyses. Gold nano-particles lie on the surface of the chip and are chemically programed with an antibody receptor in such a way that they are capable of specifically attracting the protein markers circulating in blood. When a drop of blood is injected into the chip, it circulates through the micro-channels and if cancer markers are present in the blood, they will stick to the nano-particles located on the micro-channels as they pass by, setting off changes in what is known as the "plasmonic resonance". 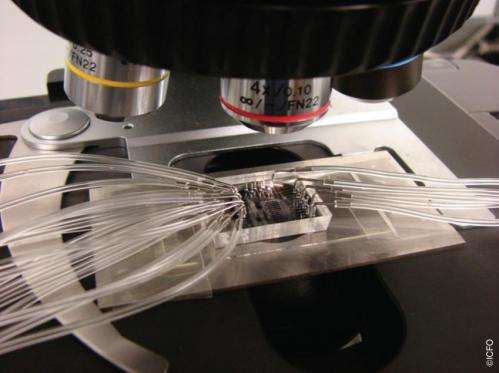 The device monitors these changes, the magnitude of which are directly related to the concentration/number of markers in the patient blood thus providing a direct assessment of the risk for the patient to develop a cancer.